Squier has once again expanded its Vintage Modified Series, this time with the addition of two new bass guitars, which have been designed around the classic Telecaster body shape - the Telecaster Bass and the Telecaster Bass Special. The main difference between the two models is the pickup choice. On the standard VM Telecaster Bass you'll find a single Duncan Designed PB-102 SCPB single-coil, which has three tone circuit options, including baritone, modern bass and double-bass sounds. The tone control can only be used on the middle, modern bass setting, the other two just offer volume control. On the other hand, the VM Telecaster Bass Special features a Duncan Designed JB-102B single-coil Jazz Bass pickup on the bridge and a Fender-designed Wide Range humbucker at the neck and a more traditional three-way switch that allows either/or, or both pickups at once. Check out the full press release for both basses below. No word on pricing and availability yet, but both models will be available in Black and Vintage Blonde finishes. 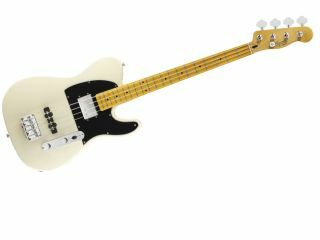 Squier is very proud to introduce its new Telecaster Bass, which presents an exciting new sonic and stylish twist on a long-familiar design. Its time-honored body and headstock shape are well balanced by a comfortable medium scale length (32") that will appeal to bassists and guitarists alike. Remarkable tonal versatility comes from a single powerful Duncan Designed™ PB-102 SCPB single-coil pickup and three-way switching among special tone circuits, which feature a modern bass sound (middle switch position, volume and tone controls), softer "double bass" sound (neck switch position, volume control only) and authentic tic-tac "baritone" sound (bridge switch position, volume control only). Other distinctive features include black "barrel" switch tip, knurled chrome control knobs, vintage style bridge with two brass saddles, vintage-style tuners and strap buttons, and single-ply pickguard (white on Black model, black on Vintage Blonde model). Squier is very proud to introduce its new Telecaster Bass Special, which presents an exciting new sonic and stylish twist on a long-familiar design. Its time-honored body and headstock shape are well balanced by a comfortable medium scale length (32") that will appeal to bassists and guitarists alike. Remarkable tonal versatility comes from its large chrome-covered Fender®-designed Wide Range humbucking neck pickup, Duncan Designed™ JB-102B single-coil Jazz Bass® bridge pickup, and three-way blade switching (both pickups together and each pickup individually). Other distinctive features include black "barrel" switch tip, knurled chrome control knobs, vintage style bridge with four chrome saddles, vintage-style tuners and strap buttons, and single-ply pickguard (white on Black model, black on Vintage Blonde model).